Hello world! As you may or may not have noticed, Vegan Muffin is a blog written by my lovely wife-to-be, Andree-Anne and yours truly. At least in name only. I’m afraid I’ve been something of a slacker in contributing my own reviews for the blog. But I’m happy to report that I’m finally going to be writing a lot more and will be providing my two cents on a variety of vegan-related topics from product reviews to vegan politics and the hilarity therein. Valentine’s Day came and went this past Tuesday and while every day is Valentine’s Day as far as I’m concerned (living with an amazing woman like Andree-Anne will do that to you), I specifically go out of my way on this day to make my Queen feel even more special. So I took her out for a romantic dinner for two at our favorite new Vegan restaurant, Aux Vivres. Some of you may recall our last visit there where we dined on some of the most delicious waffles we’ve ever tasted. This time around, we went for dinner and we weren’t disappointed. I arrived at Aux Vivres before my sweetie and asked the hostess for a romantic spot for two. Now, as much as I adore this restaurant and the values it stands for, I do have a little bone to pick with them. It seems like without fail, whenever we go there, the first place they always seem to seat us is next to the bathrooms. They did that the first time we went there (but thankfully reseated us once we made it clear that the only odors we wanted to inhale were the aromas of fresh ground coffee and organic maple syrup as opposed to the manmade concoctions one creates while sitting on the porcelain throne) and they did it again on the 14th. They may want to seriously reconsider the seating arrangements as I can’t imagine anyone seriously wanting to sit next to the flatulence express. Once we were seated, we perused the menu and decided on a variety of items. We both ordered the Aux Vivres Burger, which consisted of a fresh “garden patty,” chipotle mayo, pickles, lettuce, tomatoes and caramelized onions along with side orders of roasted potato wedges, coleslaw and chipotle ketchup. I ordered a side garden salad with dill dressing. She ordered some corn bread with vege-butter. For drinks, she had a raspberry lemonade and I had a Cafe Frappe smoothie. Needless to say, our taste buds experienced a barrage of mouth orgasms the likes of which they’ve never felt before. I’ve had plenty of veggie burgers in the past and while the ones at Harvey’s and Benedict’s passed the test as far as notable edibles go, they paled in comparison to the mouth-watering ecstasy that was the Aux Vivres Burger. I’m not entirely sure what the patty was made of. 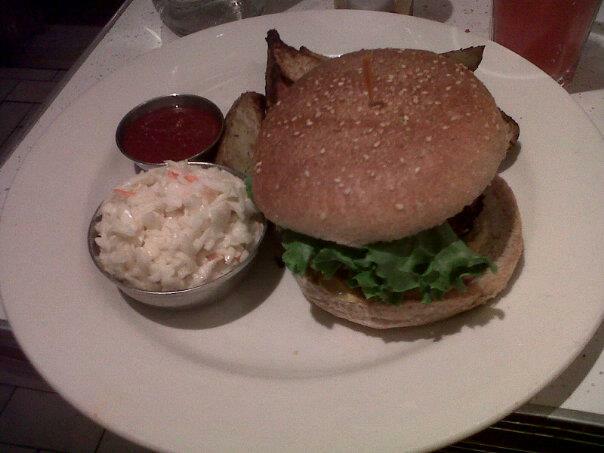 They also serve tofu, tempeh and mushrooms burgers, so clearly the patty is not made of those materials. I imagine it’s a patty made of a variety of vegetables forged in such a manner as if to resemble an actual patty. Case in point, when you take a bite into it, there are shades of red mimicking what a medium rare patty would look like. The choice of toppings complemented the burger nicely and I especially appreciated the fact that they divided the toppings equally on both sides of the patty. All too often, the toppings are piled on top of each other, canceling the various tastes out. But in this case, when I took a bite, I was first greeted by the tangy mustard, crisp lettuce and succulent patty followed by the spicy mayo and refreshing pickle. Great, great stuff. I was initially about to complain about the portions (which admittedly aren’t plentiful) but much like Boustan’s (an amazing Lebanese restaurant that we’ll one day write a review for), good things come in small packages, or in this case, portions as it doesn’t take much for you to feel full and satisfied. The potato wedges were delicious but the coleslaw was a little watery I’m afraid. As far as the sides go, my garden salad was absolutely divine. It consisted of lettuce, peppers, tomatoes, cucumbers with my choice of dressing. I chose the dill and wasn’t disappointed. My sweetie’s corn bread was also quite tasty and the vege-butter that came with it was pretty impressive. It had a cheesy taste leaving us wondering what it was made of. I can’t recommend their smoothies enough. The Cafe Frappe smoothie was amazing! It was so sweet it could almost be a dessert in its own right. My sweetie’s soda was also refreshing but we knew that already as we often purchase this organic soda when we go grocery shopping. The main disappointment with the meal, however lay in the dessert. We ordered an apple pie to go and we were quite unsatisfied with the choice. The crust was tasty but the pie had a lemony aftertaste which seemed to clash with the apples. Next time, we’ll probably go with the uncheese cake or the promising apple chocolate cake. The poor choice in dessert notwithstanding, Aux Vivres has quickly become a new favorite for us. So much so, that we plan on turning brunch/dinner a weekly tradition so stay tuned for more Aux Vivres reviews to come! This is probably the best veggie burger Matthew and I have ever had… We found this product at our local organic grocery store, Ecollegey. I have seen a lot of recipes for veggie burgers made with portobello mushrooms, but seeing as we are both allergic to all mushrooms, we had to find an alternative. There are also bean burgers, which we will eventually try out. 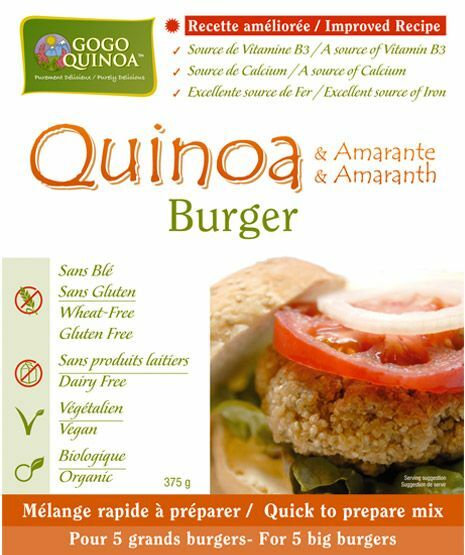 GoGo Quinoa had the advantage of being a premade mix – you just add water, wait 5 minutes, make your patties, and cook them (on the pan or barbecue – latter would probably be best). Be careful not to add too much water because you won’t be able to use the stuff. Cook each side until golden brown-ish. It’s also gluten-free, vegan and organic. I have been hearing and reading a lot about how a lot of people do not like gluten-free because it tastes weird. These burgers taste amazing, and you wouldn’t even know it’s gluten-free. Seriously. We also noticed they are a lot more filling than regular meat burgers, and definitely healthier. all it took was one veggie burger each! So basically, a win-win situation. The box says it makes 5 big patties… That’s true. 5 BIG patties. Like, huge. What I usually do is take the amount I need and adjust the water required. I have to warn you, though, that the preparation is quite messy; but believe me, it’s absolutely worth it! With some Vegenaise, tomatoes, fresh lettuce (that’s usually what I put in mine); or whatever else, it tastes amazing. It’s approximately $7 for the box, but when you do the math, it’s reasonable because it gives you 5 huge patties.